Social media showcases good moments. Someone’s bad moments are on the local news channels or you’re experiencing your own (hopefully it’s not on the news), and meh moments come along more often than you broadcast. 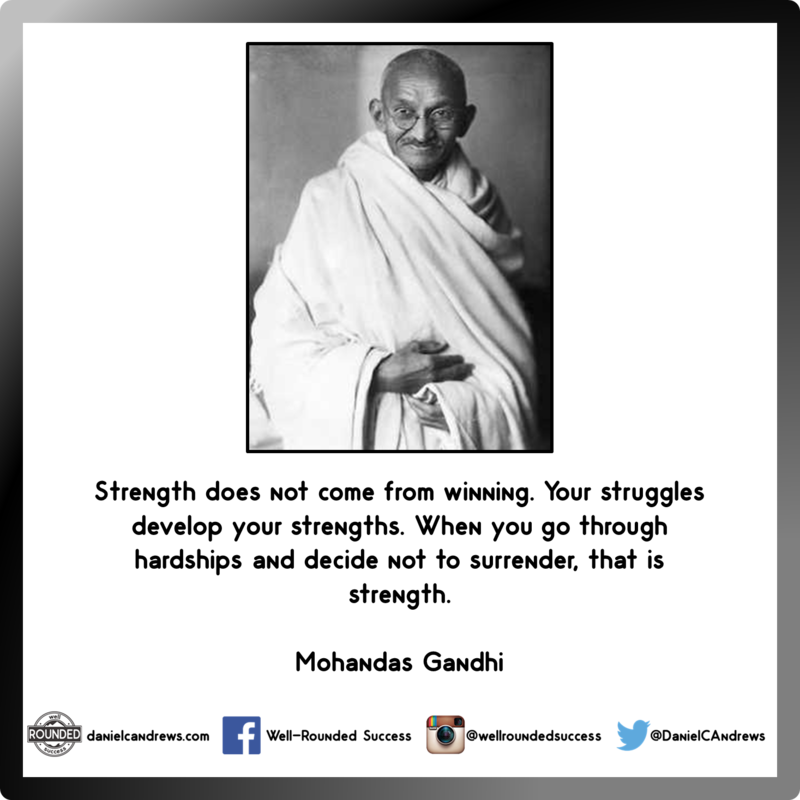 With the social media world – where we see highlight reels of our network in aggrandized states showcasing their amazing lives and fantastic accomplishments – it’s crucial to keep in perspective the reality of life which consists of a range of emotions and experiences. Even the friend who’s traveling the world for work and/or for pleasure all the time, think about the times when they’re in the airplane or car. Those are meh moments. My challenge to you: accept that meh exists, but don’t let meh consume your life. That’s when you see couch potatoes veg out. A common characteristic of this group is that they’re unmotivated to improve their current life. In order to improve, you need to be hungry to improve. Not hungry for another handful of potato chips, no matter how delicious they are. 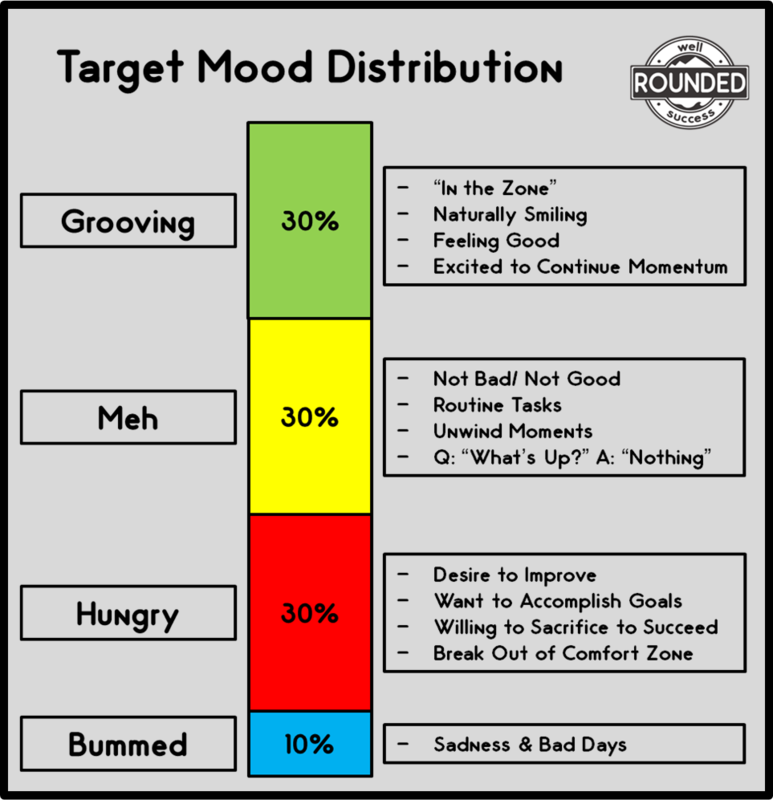 To help you pursue your healthy balance, here’s a graphic that illustrates a target allocation between your moods. Below the graphic are explanations that go into further detail about each category. You might not experience each one of these moods in each day so please realize that this target is for your week, month, and year. “In the Zone” refers to that confident attitude where you can’t miss and nothing can break your concentration. In other words, you’re having a blast. If you remember the video game, NBA Jam, just think of when your player hits three three-pointers in a row and then the game’s announcer screams, “He’s on fire!” Your player then can’t miss unless you make a very reckless shot. Here are some examples of certain activities where you’re grooving: working on projects, playing sports, or in serious conversations. For me, one of the most enjoyable “grooving” experiences is when I’m obsessed with a puzzle. Time flies when you’re grooving and in order to feel fulfilled, find out where you groove naturally. If your workplace doesn’t offer you a chance to get into this state of flow, find a hobby! Do something that excites you. Taking a breather is fine. Also, getting groceries, going to the gym, completing errands, going to the doctor’s office, assembling IKEA furniture, getting your teeth cleaned, taking the dog for a walk, and all other so-so moments are all part of life and are fine to experience. 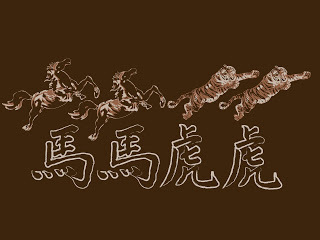 馬馬虎虎 (mǎmǎ hǔhǔ) in Mandarin literally means “horse horse tiger tiger.” Yet, colloquially it means “so-so.” This in Mandarin means that the issue is not bad and not good. The issue that they’re describing is not as basic as a horse and it’s not as grand as a tiger. It falls in between. Recognize that your life can fall in between with your fantastic self on your résumé and the person who occasionally has a bad luck streak. And here’s the important part: there’s nothing wrong with your meh self! Break out of your comfort zone. This is the uncomfortable stage that motivates you. Motivation cannot come from anywhere else other than inside of you. Strive to better yourself personally or professionally. You can become a better partner for your significant other, you can train for a race, you can work to become a better citizen for your community by giving back, or you can work on becoming a better contributor to your workplace. This area of life is not your routine, but your desire to push your limits to create new routines. Be proud of yourself when you get into this hungry state. You’ll impress yourself, you’ll inspire your own network, and you’ll feel good whenever you make progress. You’ll experience these feelings and qualities when you’re pushing yourself out of your comfort zone. In our fast-paced lives it’s important to recognize that it’s normal to feel unpleasant feelings. Family emergencies, accidents, medical issues, meltdowns, relationship struggles, and tragedies are all examples of times where you’re going to feel blue. It’s not healthy to live your life inundated by these emotions which is why you need to seek help, talk to a trustworthy friend or family member, take a break, write in a journal, meditate, or do whatever to lift you out of your sadness. Another area of your life that goes into this category is whenever you’re just not feeling 100%. You can be grumpy, irritated, and just in a bad mood. Justified or unjustified. And guess what? You’re just human. If you believe that you can rid your life from these emotions, good luck. The universe will find a way for you to experience some or maybe all of these emotions at some point. These emotions are all parts of human nature and it’s obnoxious to say otherwise. If someone or a type of business is promising you from never experiencing one of these feelings again, be skeptical. The only cure-all is in your mind. Time heals many issues so just find healthy outlets to lift you out of your sadness or bad mood. To target this allocation is a challenge. Especially if you’re a young professional and need to put in a few more hours of grunt work to build the foundation of your budding career and life. If you experience more of the “Grooving” emotions, then that’s great! Who wouldn’t want to be naturally smiling for the majority of their waking hours? The difficult task before you is not judging yourself for having meh moments. 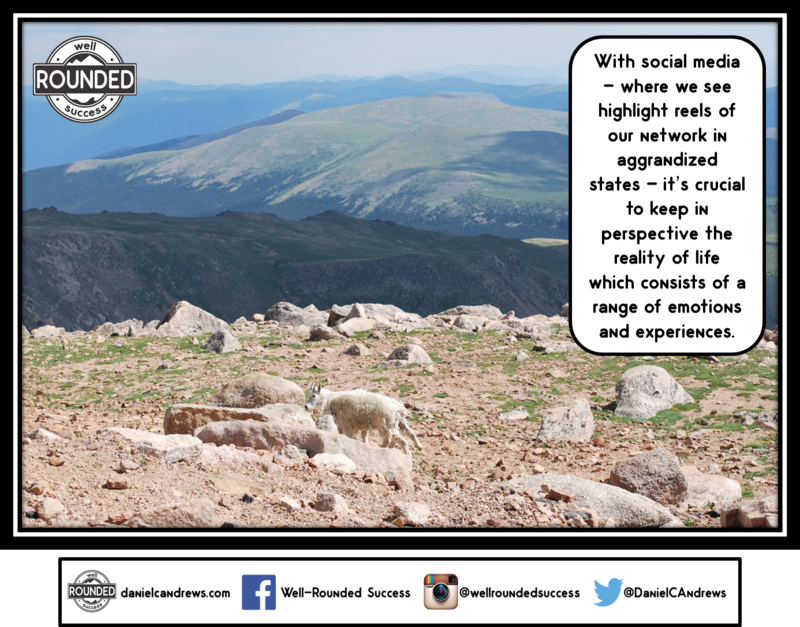 We look to fill our meh moments with distractions and many people opt to Social Media where we see most of our connections in their Grooving states. That clash of moods is sometimes disheartening. At night time, before you go to bed, practice some self-reflection and summarize your day in these four categories. Track your results for ten days and see where you stand. The results might surprise you! Now go get Hungry so you can experience the joys of Grooving! If you like the material, please share it to your network. And if you have a comment, please add it below. 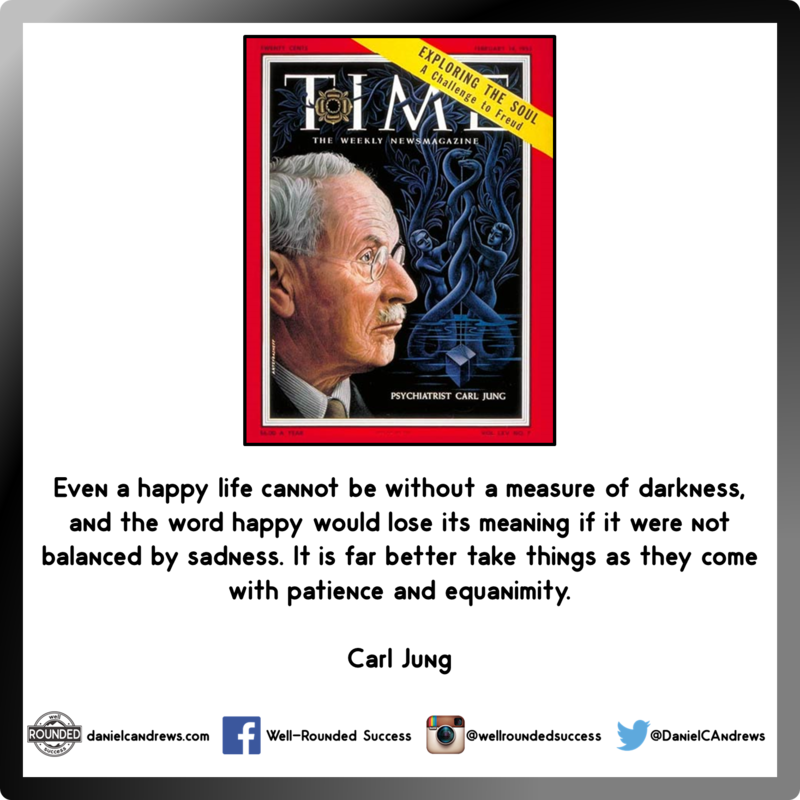 Thanks all for reading! ← Hey, Where’d You Get that Story? Great article. They say timing is everything. This article was perfectly timed for me. It is very true that we get caught up in the “go” of life and forget to “stop” and take in what is around us. Or even to check in with ourselves. Thanks brother. Comments like yours are the reason why this project is so enjoyable. Really appreciate your comment and glad you connected with the message! Thanks, Palamar. Dude, I really enjoyed reading this. You’ve outdone yourself with yet another very insightful post. That section “Bummed” reminds me something a friend of mine said – “I’m not okay, but that’s okay”. Thanks, Francis for the insights. It’s tough to be okay with not being okay and those are wise words from your friend. I appreciate your ongoing support and glad we keep in touch, amigo!